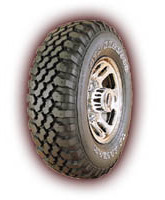 Deep shoulder lugs and a unique center traction zone create a bold, aggressive tire. Shoulder lugs are alternately scalloped so that one section always has a clear shot at fresh ground for superb traction. Precision blending of synthetic rubber and other compound ingredients contributes to long mileage and durability, plus excellent adhesion, heat dissipation and flexibility in virtually all driving conditions.